Krabathor, Centinex, Marduk, Sadistik Exekution, Satyricon, Dismember. A Tribute To Possessed (Seven Burning Churches), Der Sturmer, Desaster, Destroyer 666, Void Of Silence, Jar (Яр), Enthroned, Helrunar, Karg, Pseudogod, Thornspawn‎, Trelldom. Naer Mataron, Nifelheim, Throneum, Tsjuder, Velimor (Велимор). Батюшка (Batushka), Vader, Besatt, Holy Death, Voidhanger, Falkenbach, Marduk, Morodkh, Vetche (Вече), Enthroned, Satyricon, Summoning, Ragnarok, Krabathor, Centinex, Veld, Vietah, Todestriebe, Bestial Mockery, Secrets Of The Moon, Pungent Stench. Website is under re-construction after the heavy problem with host-service - full version will be online in nearest weeks. Thanks for the understanding! Contact via fatalecstasy@mail.ru in case of urgent questions. Aosoth, Marduk, Masachist, Horna, Lunar Aurora, Lustre, Todestriebe, Knyazhaija Pustyn (Княжая Пустынь). 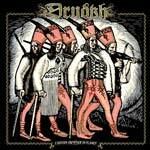 Rare editions of Branikald, Absurd/Grand Belial's Key/Sigrblot Split, Absurd, M8L8TH, Nokturnal Mortum, Khors, Pungent Stench are available in limited copies. Release-2015: Horna, Graveland, Christ Agony. The CD-section in our MAILORDER was updated. The CD-section of our MAILORDER was updated. New album-2014 of Aria (Ария) "Через Все Времена (Through All Times)" as Limited Digipack with 1 bonus-track. 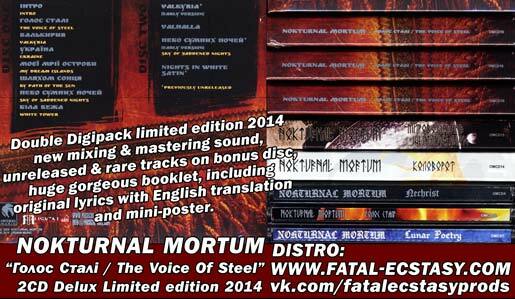 New arrivals: fresh edition-2014 of Nokturnal Mortum "Голос Сталі/ The Voice Of Steel. 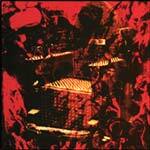 LTD" as 2CD Delux Digipack with rare and unreleased tracks, and band's back catalogue. Also: Arkona (Аркона), Aura Noir, Bewitched, Desaster, Drudkh, Hell Militia, Impaled Nazarene, Inquisition, Kruiz (Круиз), Kypck, Necrophobic, Order Of The Ebon Hand, Pest, Summoning, Temnozor (Темнозорь), Ulvegr. June 20-21, Varniai, Lithuania. Ticket for 3 days - 35 euros. New release of ВLAZEBIRTH HALL will be available via our mailorder since June 27: BRANIKALD "Tingov Naslazhdayas' Rasprey (Тингов Наслаждаясь Распрей‏)" (before unreleased album was recorded in 2000, incl. 8 tracks on 45 minutes, limited digipack-edition). Russian Elite Black Metal! 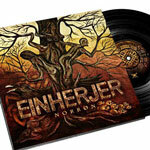 New sections in our MAILORDER - immortal analog format VINYL and musical VIDEO (DVD). 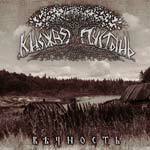 Brandnew albums 2012 of Russian pagan & black metal scene in our MAILORDER: Butterfly Temple, Mor, Vikhr, Navjarmaahr, Massenhinrichtung, Raven Throne. Greetings! We're in trip until December, 20 - please, be patient if your mail/ request stayed without our reply! All mail will be answered! 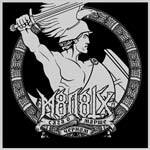 | BRANIKALD never released album "Раздувая Тинг Ветров/ Razduvaja Ting Vetrov" 1999 has been just issued by BlazeBirth Hall (Russia) as Digipack CD (Limited to 1000 copies). New correct English title of the album is "Inflaming En Vindralthing Far" - not "Rising Up The Thing Of The Winds" as it was spread before. The booklet includes English translation of the lyrics and mini-poster of the front artwork. Total time - 45 mins/ 6 tracks. Photos/ more details - soon. or 25 USD - World (incl. Priority registered mail with tracking number & Paypal fee). | New album of Belarussian legendary doom band GODS TOWER "Steel Says Last" is available via MAILORDER. Music for this album was composed in the 90s by the band' founder guitarist Alexander Urakoff, who died in December 2003. In 2010 Gods Tower was re-united by 4 members from the golden age of the band, and in 2011 the new line-up recorded songs which was known from old concerts and demo recordings. | News from BLAZEBIRTH HALL camp: in November will be released a long time hidden album "Rising Up The Thing Of The Winds" of Russian Black Metal Cult BRANIKALD. Album was recorded in 1999, but never before released. Digipack edition will be limited to 1000 copies. 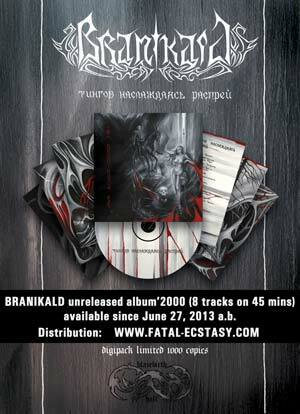 Distribution via Fatal Ecstasy Prods - ask details of the pre-order. | MAILORDER LIST is updated: A brandnew album "Nash Mir/ Our World" of Velimor (Russian Pagan Black Metal from Novomoskovsk), limited editions of Haemoth, restock of Nitberg, Graveland, Ygg. | New Ukrainian Black Metal band YGG, created by bassist Vrolok (ex-Nokturnal Mortum, 2000-2011) and guitarist Helg (ex-Khors), have just released the debut album "Ygg" via Oriana Music. It's an Atmospheric Black Metal filled with "the cold feeling of ancient times" under the barbaric sounds of vargan & shamanic drums. Total time - 64 mins/ 7 tracks. Artworks & design by Sigrun Hammerdottir (BlazeBirth Hall). 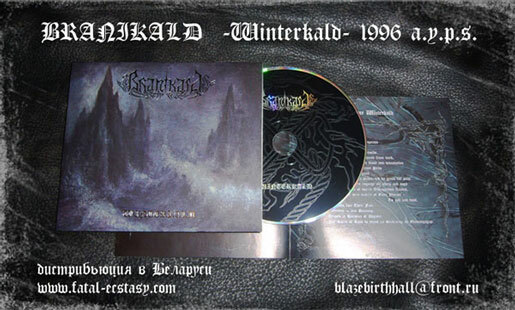 | The classical album of Cult Russian Black Metal horde BRANIKALD' "Winterkald" 1996 has been just re-released through BlazeBirth Hall as digipack, limited to 500 copies. Distribution via Fatal Ecstasy Prods.